Kendal High Street @ High.St - High Street shops and High St businesses. Large Google map of Kendal High St.
Kendal is the Gateway to the Lake District and just off the M6. 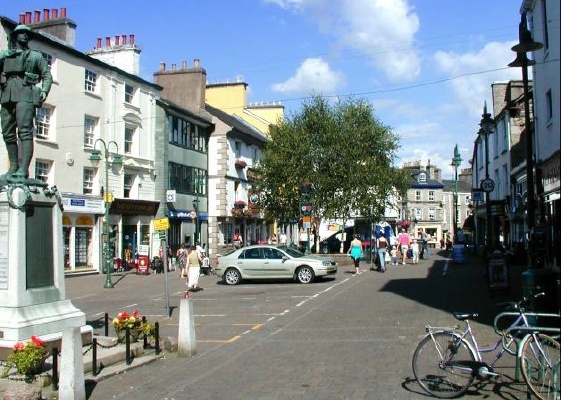 It is no surprise therefore that it is a busy town and has many more shops than listed here. Most shops are along Stricklandgate, which runs North/South from the top (West) end of Market Place but the real character of Kendal and the pedestrianised area is Market Place so we have shown that here. Being so close to the Lake District, it is no surprise to find several activity based facilities; such as: Kendal Leisure Centre, the Kendal Climbing Wall and even the Kendal Ski Slope. The Kendal Museum is open for those less active. More general information is available on the Visit Cumbria website.